Discussion in 'Civ4 - Modpacks' started by Maniac, Nov 30, 2007. See the FAQ in the next post on where to place them. THANKS to WarKirby for providing the sound files, and to sylandro for providing the movies. Earth, 2060. A small group of colonists leaves the ravages of Earth for a distant planet orbiting Alpha Centauri's primary star. Their ship, the United Nations Starship Unity, carries them on their journey to a new world and a new hope for humankind. Along the way a reactor malfunction damages the Unity, precipitating a crisis among the ship's seven most powerful leaders. As they enter the Alpha Centauri system, the crew splits into seven distinct factions, divided not by nationality, but by ideology, and their vision for the new world. After the ship breaks apart, the seven leaders guide their chosen crew down to the surface of Planet, seeking their destiny beneath an alien sky. Planetfall is a mod for Sid Meier's Civilization 4 that uses the storyline and characters from Sid Meier's Alpha Centauri, combined with gameplay that takes the best from SMAC, Civilization, and the modding community. Planetfall is not a clone of SMAC using the Civ4 engine, but rather incorporates the Factions, general storyline and Characters combined with new gameplay modifications to allow for more strategic gameplay. And many other contributors. See Readme. Besides in this thread, you can also discuss Planetfall in this forum. Tielby and The_J like this. Q: Planetfall crashes right away when I try to start the game. What's up? There are many people who swear they have the latest official Firaxis patch 3.19, but then it turns out they haven't. A big reason is the automatic updater inside the game doesn't work correctly. If that's how you believe you got the latest patch, download the patch "again" from here and install it manually to be sure. "What is UAC and how do I disable it?" Q: Where do I need to place and extract the BIK movie files I just downloaded? A: You need to place them in Beyond the Sword/Mods/Planetfall v1x/Assets/Art/Movies. The files have been archived into .rar format, so you'll probably need WinRAR or 7-Zip to extract them. Q: Is it possible to hear the original SMAC voice quotes in Planetfall? A: Yes it is. Many of the tech and base facility quotes are used. 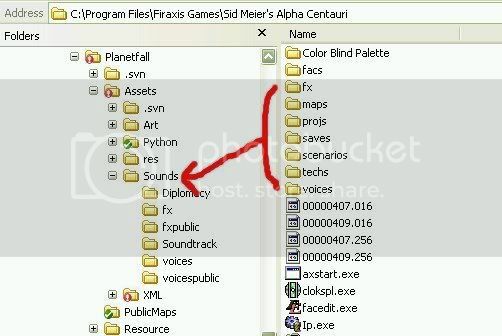 To enable the voice quotes, you should copy the SMAC fx and voices folder into the Planetfall Sounds folder, as indicated on the screenshot. If you do not do this, you'll just hear a 'ping' upon researching a technology. Q: But I don't own SMAC, and I want to hear SMAC sounds! A: Sorry to hear that. You may be able to purchase it here though. But do hurry. Good things never last. Q: Are there recommended settings, when playing Planetfall? Era: Use Arrival for playing the original seven factions. You need to choose the Expansion Era to play the four SMAX factions. Advanced start (the one which allows to purchase stuff): Not recommended, as no AI code has been added to make the AI consider a Hybrid strategy right from the start. No Barbarians Not recommended, as it disables a key element of the mod. Raging Barbarians Only recommended, if an extra challenge is desired. Unrestricted leaders Not recommended as leaders and their factions are designed as a complete package. Choose religions Not recommended - PF's religions carry special effects and have their fitting place in the tech tree; also causes interface issues. No technology trading Not Recommended - interferes with the following, default setting. No technology brokering Should be activated, because Zakharovs trait depends partly on this setting. Scattered landing pods Can be activated to enhance AI performance in exchange for less early conflicts, but the mod is desiged for having this disabled. Q: How can I best help playtest for bugs and crashes? ; The maximum number of autosaves kept in the directory before being deleted. ; Specify the number of turns between autoSaves. 0 means no autosave. Having MaxAutoSaves at 20 or so should also suffice. If you suffer a crash, please immediately copy all your autosaves - located with me in My Documents\My Games\Beyond the Sword\Saves\single\auto - into some other folder, before you start a new game (because starting a new game deletes all autosaves). I may request to send me the latest couple autosaves if I can't find the problem in the turn of the crash itself. Q: Help! I can't see any fungus on land! A: Your computer probably has an older graphics card. Fortunately there's a solution to make all features visible. It won't look as pretty, but at least you'll be able to see where there's fungus. The solution is like this. In Planetfall\Assets\XML\Art there's a file called CIV4ArtDefines_FeatureLoGfx.xml - rename it to CIV4ArtDefines_Feature.xml, overwriting the file currently named like that, and problem solved. Q: Does Planetfall include a Unit Workshop? A: No it doesn't, and it won't. Q: Does Planetfall include elevation terraforming and planet busters creating big craters? A: No, Planetfall does not include these features. Q: Does Planetfall include Blind Research? A: Personally I feel picking your tech strategy is one of the biggest decisions you make in a civ game. I therefore do not see the attraction in Blind Research at all, and do not wish to spend any time on coding that myself. If someone else would code a Blind Research system, I would of course add it to Planetfall. Barring that, you could just follow the recommendations you are given when you need to pick a new tech: there are always two techs recommended. The following posts detail what you can do to help Planetfall if you want to. Bug and Gameplay Task List mostly outdated by now, but if you can help with SDK in general, do tell! Check this thread for which ones. Due to the immobile fungal towers?? In the up to date SDK files it's on line 10570. In any case, this assert seems to be given needlessly. It's probably just that the game designers never expected someone to create a promotion which gives -1 movement points (the missile launcher in this case). However this promotion works just fine, and is causing no problems to the game. Ellestar says: related to an Isle of the Deep somehow getting UNITAI_ATTACK. Edit: This one is not Planetfall-specific, but occurs in unmodded BtS as well. The attached save (link) is causing two of the "line 168" assert. Declare war on Morgan and click to end turn. I'm not sure, but it seems to be causing by Morgan capturing & razing one of my bases. Based on one of the maps found here. The first map looks the most promising, but some details were left out in the conversion. See the Mount of Planet area for instance. So the map needs to be retouched. Only the land-ocean division needs to be done at the moment. I'd like to draw the rough lines for highlands and ridges myself, but hope that after that someone else with more of a map creation feel would be interesting in giving them a more natural look. The attached map should be loaded in vanilla BtS. As long as no features and stuff are added, it can be easily converted to be Planetfall-compatible. * Help create recruitment posters for Planetfall! See some examples and ideas in this thread. On the left you see the Greenhouse. On the right a White Algae resource. The problem is the Algae resource is hardly visible anymore when placing a Greenhouse on it. Therefore I'd like to create a seperate improvement for enabling Algae resources, with a different graphic. Namely two somewhat smaller greenhouses, one placed on each side of the algae resource. A naval version of the Material Supplies unit. Could look like a transport foil with one of the cargo bays replaced by a burned unity landing pod as seen in the Material Supplies unit. No specific requirements here, as long as they look futuristic. Currently there are a couple infantry models in Planetfall which don't fit IMO. The InVitro graphic comes foremost to mind. Also two flame/plasmathrower models for the Hyperian and Helion units would be useful. Perhaps a retextured Sea Spawning Spot? Something like SMAC's Gaian sea base look? The land model of the fungal tower looks kinda odd on water. A possible alternative: create a version without any stalk, with only the crown. And with the tentacles on the sides pointed more upwards, so they are not hanging into the water. As for possible animations, this may just be an wild dream, but I kinda imagined the fungal tower would have a couple tentacles attached to the sides of the top (as in Units.pcx) which would move randomly in the air while simply animated, and lash out at the target like a whip while being attacked or doing its ranged strike. Other possibility (especially for a ranged attack animation) would be a little hole opening at the center of the top of the fungal tower, and a little orange cloud (see current spore launcher animations) - representing locusts - streaming out of it and doing an attack run on the target. Perhaps a slightly damaged disc as on the button for this project, together with a small side-building for control, and a windmill for energy. As per SMAC Battle Ogre Mk1. Something like the StarCraft Dragoon. The Progenitor ship which appears in the SMAX intro movie and the Progenitor victory movie. Unfortunately the model currently in the game has no texture and has an excessive polygon count. A new model is needed. 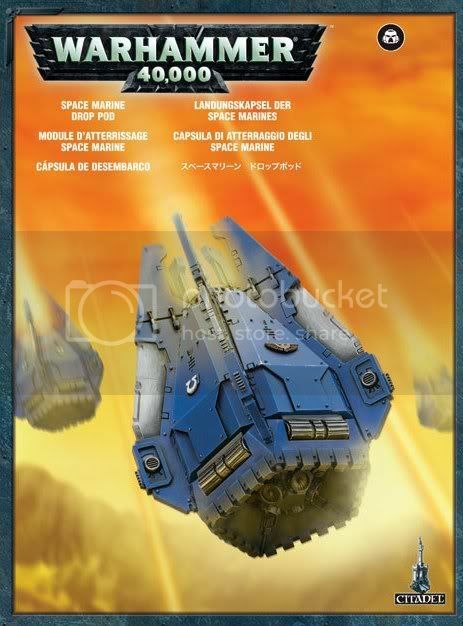 Something like the drop pods in Starship Troopers, or like this pic and video I found on Warhammer. (The interior shouldn't have any details of course. The drop pod could land, open its pod doors and then fade away to be replaced by the unit that just dropped. I'd suggest using the SMAC Empath graphic for Planetfall's similarly named specialist. The SMAC source material is rectangle instead of square. This didn't cause a big problem for the other specialist button, as the SMAC source's background was black anyways (so could easily be turned transparent). But it does form a problem for the Empath. The background is an integral part of the button, and without adding stuff to the left and right, the hands would look cut off. Any method to create a good looking square button from the SMAC source material? If not, any other ideas for what the Empath button can look like? The Sea Base graphic should always be centered, even if other buildings like the Naval Yard are added. Since Lord Tirian told me how I can see how much triangles a model has, I had a look at how many polygons the graphics currently in Planetfall use. And I discovered a lot of the graphics have much more polygons than I'd expect from glancing at the wireframe of the model. This includes ALL of woodelf's graphics. 1) Some models are made with TriStrips instead of TriShapes. A big no-no if the model gets to 1000+ polygons in complexity so I've been told. 2) Even when in TriShapes, these models have been made much too detailed than is necessary for Civ4. A lot could be done by improving the dds texture instead of having all those extra faces and triangles to the model. The good news is that if these models were retouched or redone correctly, Planetfall would probably run much smoother, less lag when scrolling over the map etc. I realize fixing old stuff is probably much more boring than creating models for new stuff, but doing it would improve Planetfall a lot. Some stuff I put between brackets because at first glance their # of triangles seems to match the model's complexity. But because they were made by the same author who made extremely high polygon models, I assume my first glance could be wrong, and their poly count could be significantly reduced as well. * Unit Models for Great Person units. What do you guys want Documentation about? * How should the main screen look like? What should the Terrain Improvement buttons look like? Alternatively it could be enabled by a Nanoreplicator building enabled by the Nanites tech, but then I think enabling gold hurrying should only be a secondary effect of that building - so an idea for its most important effect would be needed. Well, IF certain buildings are required to construct certain stuff, a Nanoreplicator could abandon this approach and make the base be able to produce everything without the need of specific manufacturing facilities. If this is not the case, an idea is that a Nanoreplicator disbands all previous mineral-enhancing facilities, or at least their negative effects (like for instance the extra drone from the GeneJack facility in SMAC. A third option is that Nanites (which the Nanoreplicator provides so to speak) act as a sort of production decreaser like marble, stone and gold do for wonders in CIV. Or a combination of the above of course. I'd prefer the second option (enabled on a per-city basis by the Nanoreplicator), and I don't think the Nanoreplicator needs to have any other function to be worth building. Superb, will test this weekend, I hope. When i try to DL Planetfall and patch, I get a message on Rapidshare stating that the file has been deleted by the uploader. This certainly looks like a mod that could bring back the glory and fun of the Alpha Centauri series. I would be happy to test this for you as it progresses through production. Very Exciting! I'll try it out and pass on my thoughts! Here's to the team that got it this far! Hmm - I'm getting a "file deleted by uploader" error when I try to download. Anyone else having that problem? EDIT: looks like it's at least TDGeorge and me! Me too. keen to try . WTF? Err, I'll hopefully have them reuploaded in a half hour or so. I guess I might have accidentally clicked the delete link while copy&pasting it into a file to remember the link. Took about 10 steps - and it's a slow download... but it works! Any special instructions to install this mod? And I assume I install the mod, and then patch it? You'll have to excuse me, I mostly do PBEM &#8211; so this is the first Civ4 mod I'll have ever installed! spoke a bit too soon - still getting the error on the patch file. Gut-reaction: Nanites could be a kind of "mineral replacement" - an universal resource allowing you to produce everything. I one goes the "nanite as hurrying building" route, the main advantage could be repairing units faster - that would be very in line with the nano factory from the original game. Thus the first person who clicked that link has accidentally deleted the file - just to let you know what happened. I cannot wait to try this out! Note: I haven't ever really touched the files of Civ4, so I know almost nothing about modding. But: If you could need a German translator... let me know. I own the original game in German, so I also have access to a genuine translation, helping me to keep the feel for newly introduced concepts/buildings/stuff. Same here. I was Finally able to DL the main file but not the patch . Just double-click the exe file and click Install, unless you want to install to a different folder. Woops forgot to tell. I made use of the occasion of reuploading the main mod to include the patch changes in the main file. So no patch needed for the moment.